Of course I could have twitpic'd it like I did with Bill Amberg's well crafted leather accessories range for Apple products (including a beautiful ipad case) but I think this rucksack deserves a little post of its on own. Everything created by Bill Amberg is unique but this bag is something special. Unique, not just in sustainable materials and handmade quality, but in outstanding design and innovative production techniques. Made in England by West Country craftsmen, Bill Amberg bags are frequently made from hard wearing vegetable tanned leather, (produced from one of the last remaining pit tanning operations in the UK. Here, the the more familiar tanned leather is paired with an eye catching and super soft nubuck, making this a bag to truly covet. that is just a treat, if you bought everything you loved a wonder how much debt you would be in. Mat: Ha, that is a scary thought indeed. In an odd way though I think the blog has forced me to become a little more selective with my purchases. That said, it is times like these when I'm seeing so many items that tickle my fancy at press days that test my new found restraint to the very limit. 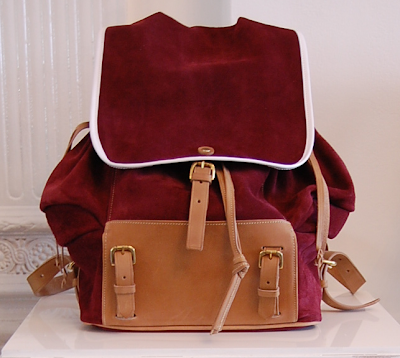 That is the epitome of a beautiful backpack. I'm sure I wouldn't be able to contain myself if I attended press days. This bag once hung timidly astride an evacuees left shoulder. Together they merrily ventured to Mrs. Wadcott and 1940s Buckinghamshire.